The migration team is migrating GOV.UK’s formats to the new publishing platform. This will mean that the template consolidation team can reduce the number of templates used on GOV.UK making it easier to manage. Formats are basically different content types. They allow publishers to enter information into different fields depending on what content type they are looking to publish on GOV.UK. We have about 140 GOV.UK formats across different publishing applications such as Whitehall, Mainstream and Specialist Publisher. More than half are present in Whitehall, which is the most complex of all the publishing applications. This includes about 100,000 pieces of content published using the Publications format and about 3500 document collections. We define templates as different ways of displaying content on GOV.UK, such as tax manuals, news articles by departments, press releases and over 140 more. 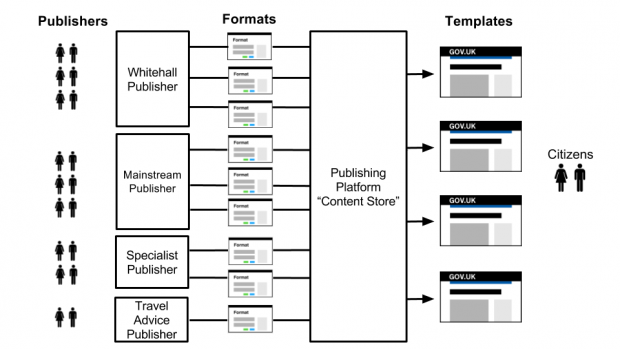 The diagram below illustrates the way content was published on GOV.UK and made viewable to users prior to migration. Publishers use formats to place content, images, attachments and other information into a specific layout such as a news article. 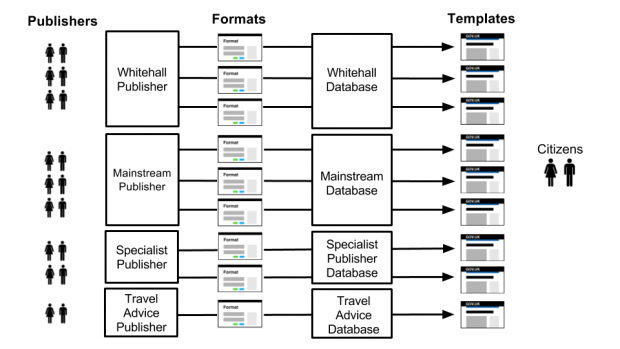 The created content for each format is stored against each publishing application’s database, for example news article content will be stored in the Whitehall database. This is then rendered by frontend apps to our various templates, making it viewable to our users. There is currently a 1 to 1 relationship with formats and templates, so there are over 140 formats and 140 templates on GOV.UK. Why do we need to reduce templates? To make consistent improvements on existing templates we need to update 140 templates and over 20 frontend applications. This requires extensive knowledge of our architecture and leads to duplication of work for our developers and designers, slowing down the process of iterating on GOV.UK. Template consolidation aims to reduce design and frontend duplication and complexity, making it simpler and faster for us to iterate. This will pave the way for exciting improvements in the future. How does the format migration work tie in with template consolidation? For all formats which have already been migrated to the publishing platform (for example Specialist Publisher and some Whitehall formats such as detailed guides), the content is stored in a centralised place called the content store. The migration programme, by creating the content store, is making it simpler to consume content by the frontend. This means template consolidation can focus on reducing the number of templates and begin to untangle the frontend architecture and make consistent template designs. However, we’ll not be reducing the number of formats or changing the publisher workflow for publishers. Our focus is on GOV.UK frontend and making this simpler. As GOV.UK aims to make government more open, both template consolidation and the migration programme are creating an architecture that allow us to do this in an iterative and easy way. We hope to respond to changing needs and contribute to making GOV.UK its own archive with this work. Humin is the Template Consolidation team's product manager. You can follow him on Twitter. Until very recently, Shilpa was a senior product manager at GOV.UK. You can follow her on Twitter too.